Do you have dreams of taking down the World Series of Poker main event? Do you long to become the next main event champion, securing yourself millions of dollars and instant fame in the process? If so, then you will be pleased to know that World Series of Poker main event qualifying satellites have now started at Full Tilt Poker. As per usual, there is a dizzying array of different satellite tournaments in which you can claim your seat to the main event. There are daily 81-player "shootouts" in which the winner will secure a $12k WSOP main event package. There are five weekly "Cash Qualifier" tournaments in which the winner will take down a $12k WSOP package. There is the ridiculously big "150 Seat Main Event Guarantee" tournament on June 21st, in which 150 players will receive a $12k WSOP main event package. There are many different ways to qualify for this tournament - if you are hoping to play in the main event, then I would recommend that you DON'T miss this tournament. There is also the "Race to the Main Event" promotion, in which a staggering 50 players will receive seats to the 2009 WSOP main event. The kicker with this promotion is that it's strictly a freeroll promo, meaning that any player that participates and wins will have paid nothing for their seat. Add this all up, and there will literally be hundreds upon hundreds of WSOP main event seats given out just by Full Tilt Poker this year. 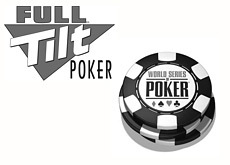 Full Tilt is also hosting a number of other WSOP-related promotions, in which entries to some of the smaller tournaments will be given out as well. According to their site, FTP has given out 59 seats to the World Series of Poker so far. What are you waiting for? Don't delay and procrastinate when it comes to winning your seat, or else you may find yourself on the outside looking in come July.